Teaching Authors--6 Children's Authors Who Also Teach Writing: Resources, Resources, Poem, Book Giveaway! Resources, Resources, Poem, Book Giveaway! I'm continuing our Teaching Authors series on helpful writing resources. April wrote about apps for writers. Esther posted about the SCBWI Conference and the official conference blog. I'm adding a list--hope you find something useful in it! 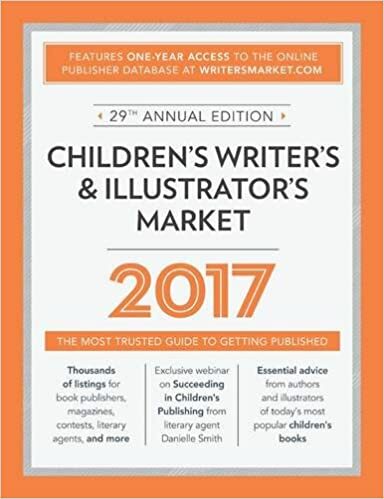 One of my favorite resources is always Children's Writer's and Illustrator's Market (CWIM). My article, "Be Your Own Literary Agent," appears in the 2017 edition. We're giving away a copy. Look below for giveaway details. The ReFoReMo Challenge, or Reading for Research Month Challenge, was founded in 2015 to help picture book writers reform writing by reading and researching mentor texts in the month of March. ReFoReMo 2017 starts on February 27. Laura Purdie Salas sends out a helpful monthly e-newsletter for children’s writers, A Writer Can Be…. (sign up here) and also a monthly e-newsletter for educators (sign up here). Picture Book Builders is a group blog that explores "how one element of a picture book’s story or art manages to grab us or wow us or strike an emotional chord." Our good friend Jill Esbaum is part of the group. Pat Zietlow Miller's February 17 post, "Crunch: It’s not just for cooking," lured me in again recently after I hadn't visited for a while. Then I just kept reading. The Art of Storytelling is an exploration of the storytelling process at Pixar. Increase your vocabulary and help fight world hunger. For each answer you get right, Free Rice donates 10 grains of rice to the United Nations World Food Program. The Writer's Almanac with Garrison Keillor is a daily email that includes a poem and brief biographical information about writers whose birthdays fall on that day. Yesterday's poem, "Lucky"
by Kirsten Dierking, grabbed me. Finally, your best resources might be your own desk drawers or computer files. Last night's storm reminded me of this poem I wrote in 1999. What surprises lurk in your old files? See what you can revisit, rework, and repurpose. Good luck! Marie D. won our latest book giveaway of Tuktuk: Tundra Tale by Robin Currie, Congratulations, Marie! To enter our new drawing for a chance to win a copy of the Children's Writer's and Illustrator's Market 2017, use the Rafflecopter widget below. You may enter via 1, 2, or all 3 options. If you choose option 2, you must leave a comment on today's blog post below or on our TeachingAuthors Facebook page. If you haven't already liked our Facebook page, please do so today! If you prefer, you may submit your comment via email to: teachingauthors [at] gmail [dot] com. Note: if you submit your comments via email or Facebook, you must still enter the drawing via the widget below. The giveaway ends March 10, 2017, and is open to U.S. residents only. Today's Poetry Friday Roundup is at Karen Edmisten*. Enjoy! Oh, I remember being addicted to Free Rice a few years ago, I'm glad to hear it's still around. As a word nerd, it was so much fun to play with words and support a great cause at the same time! Thanks for all these resources! I love that picture of the snowy owl on the lamppost. At this time of year in Florida we are getting ospreys making nests on lampposts next to the lights. I think maybe they choose this spot for a little warmth for their chicks. Thank you for the giveaway also! A great list! Hope to dive into these resources soon! Thanks! Jane, I have Free Rice on my phone & use it when I need a little break. B.J., the snowy owl was here in Wisconsin a few years ago when the weather was much colder. I loved seeing ospreys in Florida. They do show up in Wisconsin, but not as regularly. Jane, I'm glad you enjoyed the list! Wonderful posts full of great resources. I've pinned the pixar storytelling mods to do later. How great that we can learn from pixar! And, I have so many old files...I could spend a lot of time sorting. But, maybe I can pull out something that needs a look over. Thanks! Great list. Sharing resources is such a great idea. Thanks! Thanks for sharing such wonderful resources! I totally forgot about Free Rice. Also, I can't wait to explore the Art of Storytelling from Pixar. Thank you for the resources! I've also never heard of Free Rice. I have to check it out. Thanks for so many great links, JoAnn. I've done Free Rice for years, had my students doing it too! Great list, Joanne--thank you! My kids and I used to do the free rice thingy years ago--going to put it back on my radar. Thanks for all the excellent links, I'm very grateful for the chance to win the book too. Have a great weekend everyone. Thanks, everyone! I'm happy to hear about people trying Free Rice for the first time or going back to it. I'm looking forward to the Pixar program, too. Marilyn, I hope you feel better soon! Thank you for sharing these great resources! Thanks so much for the resources. This is my first time to your site-- What a great resource, and wonderful giveaway! Many outstanding resources for kid lit writers. Thank you for all of the great information and an opportunity to win. And it won't let me spell right either! Love the blog! Such a greasgreast resource. Lots of great resources. Thanks so much! Ahhh, thank you for reminding me of Free Rice! I used to spend so much time on it! It's such a win-win idea. Also love the shout out to the Market book. Such a consistently solid resource for so many years. Thank you for a great list! Thank you for these resources and great tips. Fantastic post! I'm with you, I love that poem! After the day I've had, it was thought provoking. Thanks for posting it. Also, thank you for the chance to win such a fabulous book! Thanks for all these great resources! Thank you so much. Free Rice was completely new to me, too. Subscribed via bookmark feed. Thank you! Thank you for sharing with these services! I also know one service, but it is more for students which can't write essays 99papers.com I used it several times, so I know this service is good. Thanks for the resources and contest! Thanks for this great group of resources and for the giveaway. I love your Illumination poem! Love this giveaway idea! Your blog is such a great resource for writers! I hope I win! Some of these resources were new to me, like Free Rice - how addicting is that? Thanks for sharing! I'm encouraged to make some submissions also. Thanks for that nudge! And thanks for all the blog connections. I am slowly adding to my repertoire. I see that I too have been left behind re: Free Rice! Thanks for the resources! Hello again & thank you for all your comments! I've been out of town (& back), sick (& recovered), & off the Internet (& back again). Lovely to see you all here, & I'm glad the resources were useful. Be sure to read the rest of the posts in the series! Spinning Plates and My New Website.